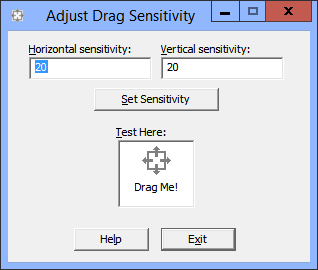 In response to a comment regarding the console-based version of the drag sensitivity utility, I’ve created a new version of the utility that includes a graphical interface and a means of testing the drag settings in the interface. There isn’t one, really. WinDragSens is completely free to download, use, modify, and distribute. WinDragSens is provided as-is, without warranty and without support. Norton removes this program claiming it is a trojan horse. That means that even though Norton didn’t find any virus signatures in the executable, it’s not an executable that Norton recognizes since it’s not widely known or popular. Norton therefore assumes that the executable is meant to do something harmful to your computer, essentially erring on the side of caution. I can tell you that not only do I have a malware scanner running on my compilation machine, but it’s also regularly run on my web site. The MD5 hash of the original file also matches the MD5 hash of the downloaded file, so I’m extremely confident that there’s nothing harmful lurking in the file.